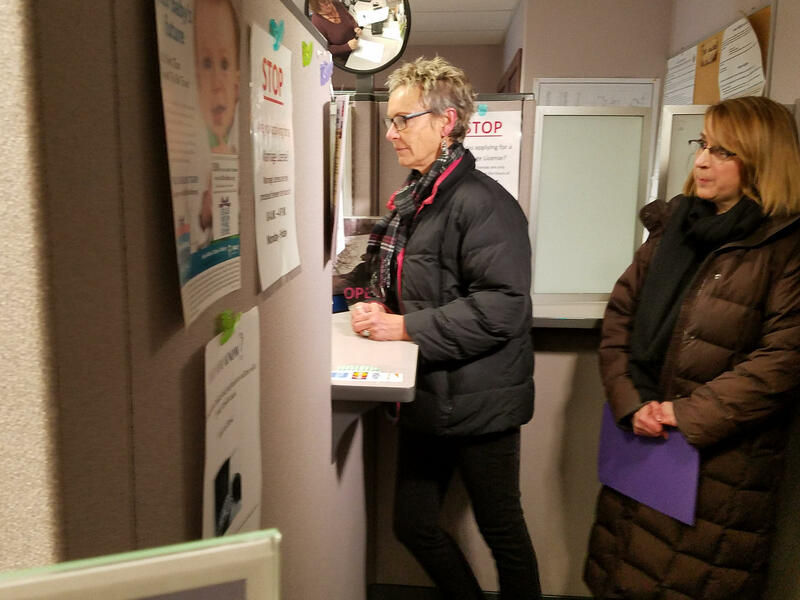 Karen Heck, left, former mayor of Waterville, and Hilary Koch, a Waterville resident, take out forms at Waterville City Hall to begin an effort to oust Mayor Nick Isgro. Isgro has been under fire for a recent tweet telling a Parkland school shooting survivor to “eat it.” He has since deleted that tweet, but his history of inflammatory and divisive comments on social media are also getting attention. The mayor shows no sign of leaving his post, even though he has parted ways with his employer. The president of Skowhegan Savings Bank says Isgro resigned as assistant vice president and controller effective Monday. John Witherspoon declined to say whether the resignation was voluntary. The action comes on the same day that former Waterville Mayor Karen Heck and several other residents launched a petition drive to recall Isgro as mayor. “The job of the Waterville mayor is to promote Waterville as an exceptional place to live, work and recreate. It is not to bully children or sow the seeds of discord,” she says. Heck says she endorsed Isgro, a Republican, when he first ran for mayor in 2014, but since then she says she has come to see from his social media posts that he no longer feels treating others with respect is necessary. Isgro has a reputation for attacking immigrants and Muslims and advancing conspiracy theories. Hilary Koch, a Waterville resident and former teacher, is among those supporting the recall. “I have read Mayor Isgro’s public statements and social media posts where he uses crass language revealing bigoted, racist ideas, a disregard for factual information or sources and a desire to inflame,” she says. It was a tweet going after Parkland school shooting survivor and gun control advocate David Hogg that unleashed a public backlash of criticism. Isgro tweeted “Eat it, Hogg” after Hogg called for a boycott of a Fox News host who ridiculed him for not getting into several colleges. Isgro later deleted the tweet and made his Twitter account private. Waterville resident Brian Evans says Isgro is out of line for several reasons. 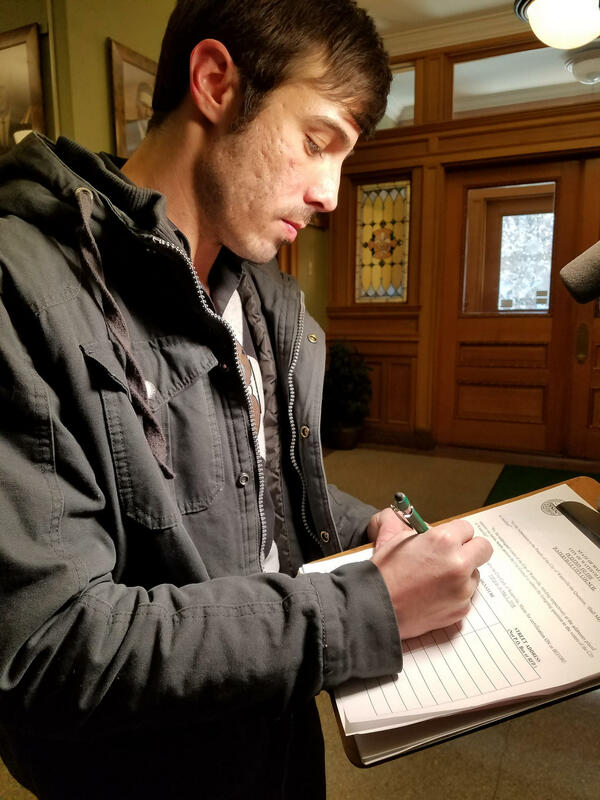 Brian Evans of Waterville adds his name to a recall petition. “His comments, the fact that he doesn’t think he needs to apologize or say he made a mistake or maybe he should have thought about what he posted. The fact that he stands by it. He thinks there’s nothing wrong with it. That’s really my biggest problem,” he says. Isgro released a statement through the city of Waterville on Monday. He thanked residents for their messages of support and blamed the recall effort on “well connected and wealthy political elites” who have a different agenda for the city. “I think that the council needs to reflect and make a decision on how we want to represent our community values,” says Jackie Dupont, a Waterville city councilor who says the mayor’s behavior is unacceptable and a poor reflection of the kind of community Waterville is. That’s why she thinks the council may have to consider its own response. “We are the elected leadership and that’s our responsibility,” she says. Councilor Winifred Tate says she has been receiving calls and emails across the political spectrum expressing their concerns about Isgro’s behavior. With a hot real estate market and downtown expansion underway, Tate says there’s a lot to feel good about. “And so the big concern I have is that this divisive and inflammatory use of social media by the mayor isn’t in the best interest of the city,” she says. Supporters of the recall effort have until May 1 to gather 857 signatures to force a recall vote. If the mayor is recalled, the city council chair would act as mayor until a new mayor is elected. This story was originally published April 9, 2018 at 2:22 p.m. ET. WATERVILLE, Maine - A Maine mayor is receiving backlash for a tweet making fun of a Parkland, Fla. school shooting survivor. The post was in response to an article about Fox News host Laura Ingraham, who mocked Hogg online and lost advertisers. The tweet has since been deleted.